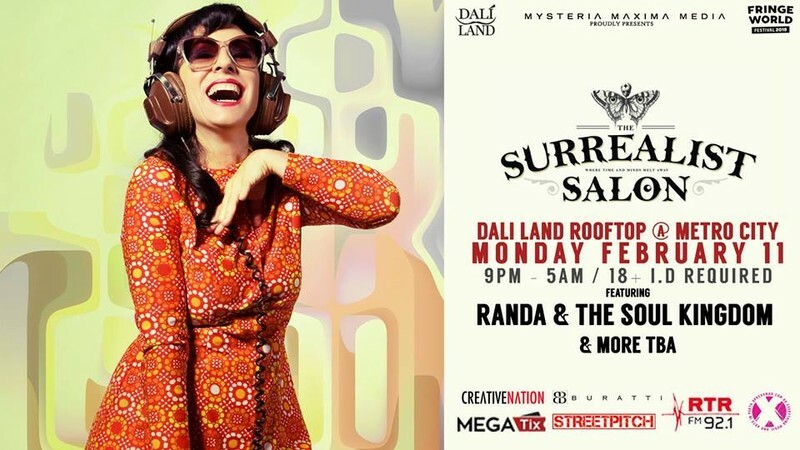 The Surrealist Salon suspends itself high above the city from Jan 18 to Feb 17, offering nightly soirees during Dali Land. "The rooftop where time stops" will showcase wonders unlike anything ever witnessed on this plane of existence. Set your imagination on fire with sights and sounds designed to melt the mind and accommodate your desires as we program a nightly surrealist feast for the eyes and ears, including live music, magic, burlesque, comedy and more. Randa And The Soul Kingdom are here to put funk in your trunk and ants in your pants! Get set for soulful horns, high-octane vocals and gritty rhythms that pack a mighty punch of feel-good goodness. Guaranteed to get you dancing—if you still have a pulse. With two albums out on London's Freestyle Records, Randa And The Soul Kingdom have established their reputation playing at festivals across Australia and Europe. Their raw, high- energy sets ignite dance floors, often sending audiences into a frenzied Soul Train. Sassy sista Randa Khamis has been lauded as a modern-day equivalent to Marva Whitney and Ann Sexton by publications 'Mojo Magazine' and 'Blues & Soul'. Her music has featured in the US version of TV show 'Skins', and most recently, 'Do Your Thing' by Dutch DJ/Producer Bakermat. Randa And The Soul Kingdom will serve up their long-awaited third album in 2019 to prove yet again they are authentic purveyors of 21st century soul.